shopsvc has no other items for sale. Dell Latitude E6510 Laptop i5 2.4GHZ - 160gb - 4GB DDR3 - Windows 10 - Ready! 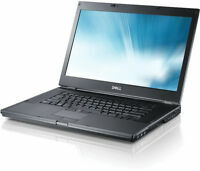 Dell Latitude E6410 Laptop i5 2.4GHZ - 250gb - 4GB DDR3 - Windows 7 - Ready! Been using the laptop for about 3 weeks. So far Im satisfied w/internet and CPU speed Ive encountered were some problems when opening the DVD drive. The drive door doesnt open quickly and you need to wait a couple of secs. Other issue was I had Windows wouldnt start up due to a profile issue. Went on the web and removed a dupe profile and now works fine. Last issue is the wifi doesnt always see my network printer. I need to reboot my router. Seller packaging was excellent.